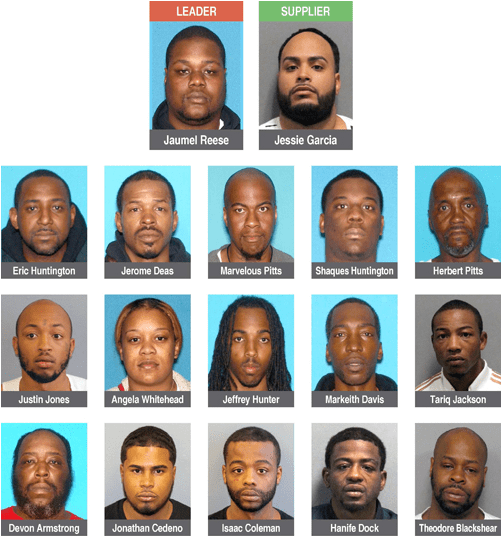 Seventeen people belonging to a drug dealing network linked to the Bloods street gang that distributed large amounts of heroin in Paterson have been indicted, authorities said on Thursday afternoon. The investigation focused on drug tracking in an area known as four corners or “4K,” referring to the corner of Mercer and Putnam streets; Rosa Parks Boulevard and Putnam Street; Mercer and Warren streets; and Rosa Parks Boulevard and Warren Street. Authorities said the area was controlled by Bloods street gang set “4K Bloods or “Korner Boyz” led by Jaumel Reese, 35, of Passaic City. Reese was arrested and his alleged bulk supplier Jesse Garcia, 27, of Lodi was picked up by authorities. Authorities recovered 4,500 packets of heroin in 90 bricks during a raid at Garcia’s residence. Police seized a handgun, hollow-nosed bullets, and over $19,000 in cash. He was additionally charged with drug, gun offenses, and money laundering. The operation yielded a total of three guns. A grand jury indicted 17 members of the ring in a 63-count indictment on Wednesday, authorities said. All 17 were charged with second-degree conspiracy to distribute heroin. Reese is additionally charged with first-degree promoting organized street crime. His alleged top “runners” or suppliers to street dealers Eric Huntington, 41, of Paterson, was charged with first-degree heroin distribution. The operation was led by New Jersey State Police Gangs & Organized Crime North Unit, the Division of Criminal Justice, the State Parole Board, the Newark Police Department, and ICE Homeland Security Investigations, with assistance from the Paterson Police Department, Morris County Sheriff’s Office, Passaic County Prosecutor’s Office, Bergen County Prosecutor’s Office, Prospect Park Police, Wallington Police, Elmwood Park Police, Passaic County Sheriff’s Office, Wayne Police, and Clifton Police. “When heroin dealing is introduced into a community, gun violence is not far behind, and if you add dangerous street gangs to the equation, the effect on a city’s residents can be devastating,” said Patrick Callahan, superintendent of the New Jersey State Police, said. Each is charged with third-degree heroin possession with the exception of Burch. Burch is a girlfriend of Reese. Burch is charged with third-degree codeine possession and falsifying government records, authorities said.